I’ve never been one to do things just because ‘all the cool kids’ are doing it, but the JBL Waterproof Speaker is definitely one of those ‘must-have’ items seen around pools and barbecues everywhere this summer. Lucky for you and me, the JBL Waterproof Speaker is on closeout sale at Macy’s right now, so it’s actually more affordable than ever. I don’t know whether the sale is happening because it’s the end of summer or because of the color of the speaker, but whatever the reason, people are scooping it up and it’s almost sold out. Not only can you get up to 20 hours’ playing time in a single charge with JBL’s Charge 3 Bluetooth speaker, but you can connect up to three smart phones or tablets and join multiple speakers to fill the room with sound. In addition to being waterproof and submersible, it also has voice integration with Siri and Google Now. 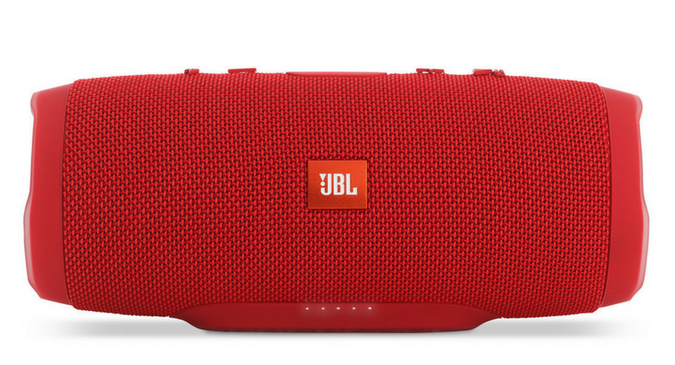 The speaker includes a JBL Charge 3, 5V 2.3A USB adapter, micro USB cable, safety sheet, and a quick-start guide. Even though it comes with a speaker, you’ll appreciate how it gets up to 20 hours’ play time between charges, making it effortlessly portable (after all, it’s less than 4 pounds!). If you want to learn even more about the JBL Waterproof Speaker before purchasing, check out the video on it here.